With the MILVIO Bridge was, in ancient Rome, one of the most important suburban bridges. It was originally built with square blocks of tufa, except the travertine arches, and was 3 arches: the central, larger than the other two, towered over the the river Tiber. In the eighth century, under Pope Adrian I, the bridge was fortified with two towers, in turn reinforced walls in the XII – XIII century and erected under Nicholas V.
The first building dates back to the Republican age and the bridge was rebuilt after the barbaric invasion of Totila. A local tradition says a meeting on this bridge 800 between Charlemagne and Leo III. In X century was the Monastery of San Silvestro in Capite, then, from 1205, was attributable to the church of San Lorenzo in Lucina, then the Convent of San Pietro in Vincoli with the church of St. Agnes Outside the Walls. 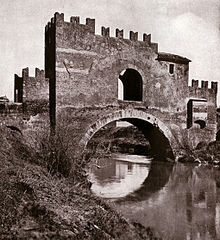 In 1433 the bridge was occupied by Niccolò Fortebraccio della Stella and Antonio Count of Pontedera, while in 1485 the bridge was won by Paolo Orsini. Later it had to undergo various renovations and adjustments. At the time of the conspiracy of the Pazzi the bridge was called “Iuxta Casale de ‘Pazzis” and understood as a property of this family. Then it underwent several changes of ownership until it became the customs of the city in 1532, before undergoing new restoration and editing. In 1849 during the French invasion he was subsequently destroyed. Seven years later, these destructions were repaired. Until 1924, the year of construction of the bridge near Tazio (which combines Nomentana Nuova with Corso Sempione), formed a forced connection between Rome and the north of the city areas. In 1997, in the fear of injury to the structure, the bridge was closed to traffic becoming, since then, a pedestrian path. Restored in 2002, it is occasionally open to the public, who can then visit its internal structures. Nomentano Bridge is a bridge over the Aniene river crossed by the Via Nomentana, in Rome's Monte Sacro district. Connecting the urban areas 4a Monte Sacro and 4h sacco pastore of III town Hall and is one of the few pedestrian bridges of Rome.